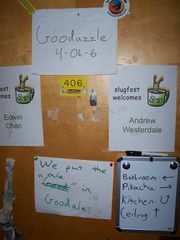 The door to Goodazzle features Pikachu's Sword and Sheath, "The Man", Directions around Goodale, self-appointed Thugfest names and a sign stating: "We put the ale in Goodale. Founded by Sluggaz A-Diddy and Big Ed, Goodazzle marks the transition, in both ambience and location, from Bemis to Goodale. Goodazzle is now home to Thuggin' Bush. Goodazzle has extended to include Ruth Shewmon's room (Goodazzle North) and Goodale Lounge (Goodazzle South). For the good of slugkind, we hope that one day Goodazzle shall rule all of 4e.